The limited form of appendiceal peritonitis may occur with different clinical picture, with a high risk of complications. Kirschner was among the first to set a reduction in mortality from peritonitis after surgery from 80-100% to 60% (1924). Protocols of surgical treatment of septic peritonitis consists of stabilizing the overall condition of the patient, identifying and correcting the causes that caused peritonitis, peritoneal lavage, the decision to leave or not to leave the drainage in the abdominal cavity and access to feeding in the postoperative period (gavage) . To date, there are contradictions regarding the advisability of establishing abdominal drainage. According to recent data, a significant statistical difference between the complications of drained and not drained in postoperative peritonitis, has not been found - 29% to 36% [2-5]. Primary closure of the abdominal cavity is consided acceptable if the cause of the contamination is isolated and controlled. Today published data “for” or “against” the drainage in the world medicine is not so much. Results drainage after appendectomy were analyzed in two randomized cohort investigations [6-7], also a meta-analysis of a group of scientists was held (Petrowsky and others 2004) . According to these studies, the establishment of drainage is not necessary, at a local limited form of appendicular peritonitis. In addition, according to research Vinnicombe  drain leaved in the abdominal cavity become quickly clogged and makes it ineffective. These data formed on the basis of our study. To determine indications and contraindications for drainagefree treatment of appendicular peritonitis in children. The study was conducted on the basis of the clinic of Tashkent Pediatric Medical Institute's experience, during the period from 2010 to 2016. Retrospective analysis of medical records was performed in 59 patients with locally limited form of appendicular peritonitis. Of these, 33 (21 children with limited local appendicular peritonitis and 12 children with unlimited local appendicular peritonitis) patients abdomen was closed tightly without leaving drainage. The remaining 10 patients underwent drainage of the abdominal cavity due to the presence of unlimited local form of appendicular peritonitis. To the drained abdominal cavity in a group of patients who underwent drainage antiseptic liquid (furatsillinum, chlorhexidine) from 5 to 20 ml, 2 times daily was injected. Age of children who admitted ranged from 1 to 18 years. The distribution of patients was carried out according to the classification of appendicular peritonitis (for AF Dronov and Kotlobovsky IV - The National Guide to Pediatric Surgery Russian.). The number of patients with the limited form of local peritonitis was 22 (37%) children with spread local form of 19 (31%). Analysis was conducted microbiological material, bacteriological culture results and antibiotic sensitivity. During the operation, one was taken and several samples of peritoneal fluid for sowing. All patients antibiotic therapy was carried out with the use of broad-spectrum antibiotics. The mean duration of hospital stay was 7 days of the day. In the analyzed period of time, death from septic peritonitis cases were not reported. During the study, was selected by a group of 59 patients with different pediatric "acute abdomen” pathology from 2010 to 2016. All patients had fever, vomiting, abdominal pain. Leukocytosis with neutrophilic shift, increased heart rate were noted. After the analysis ofage and clinical parameterssignificant difference between the two groups was not observed (Table 1). In 2 of 19 patients (drainage-free group reference) limited local form of peritonitis observed increase in body temperature up to 39.50 for 5 days after surgery. The course of antibiotic treatment, these children had to be extended by 5 days, compared to the other 17 patients in this group. In 7 of the 19 patients with local unlimited appendicular peritonitis, abdominal drainage which has not been carried out, there was accumulation of fluid in the abdominal cavity after surgical treatment conducted. 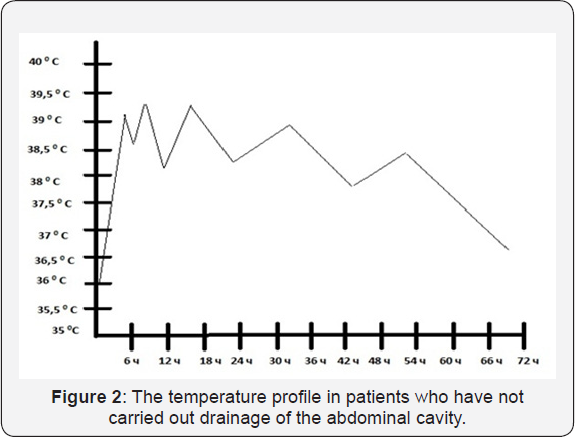 As can be seen from the (Figures 1 & 2) in the patient group, which has not been draining of the abdominal cavity, the body temperature rises to 39.5 °C. 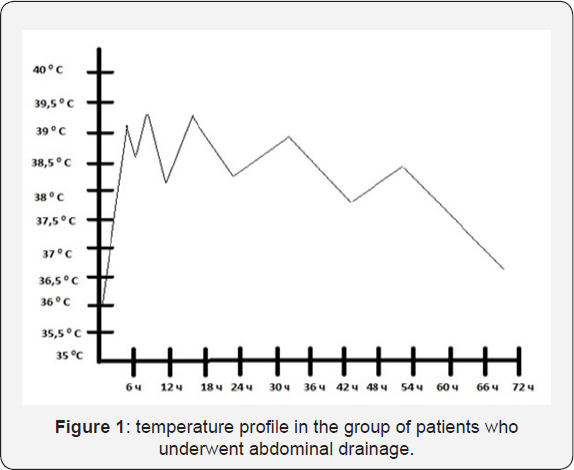 In the group of patients who underwent abdominal drainage, temperature curve also rose to 39.5 °C. In 10 patients with local unlimited form of appendicle peritonitis, which was carried out drainage of the abdominal cavity drainage tube operated from 2 to 5 days. In 3 of this children group, the tube resealed by fibrin during the first postoperative days, despite the washing antiseptic solution. The remaining 8 children, the tube was removed on day 5 because of not functioning (in 5 children) and the absence of liquid from the abdominal cavity (in 3 children). In 18 children with spread peritonitis, drainage tube leaved an average for 3 days (2 to 5 days). In 2 patients, the drain pipe also clogged within the first post-operational day. In 12 patients tube were removed in 3 PO day after the lack of liquid from the abdominal cavity through the tube. On the basis of our study, we concluded that there is no need to leave drainage of the abdominal cavity after surgery for appendicitis peritonitis in children. In our opinion, a specific, intensive antibiotic therapy, a thorough reorganization of the abdomen, detoxification therapy provide the maximum effect in the treatment of appendicle peritonitis. 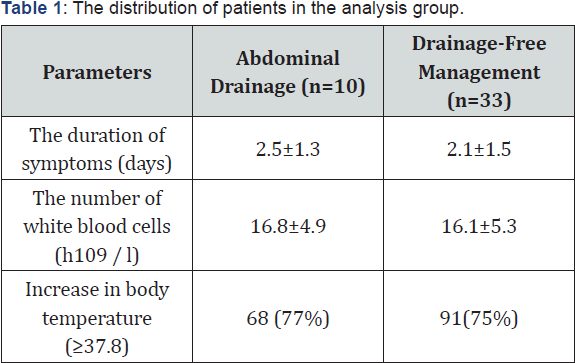 Accordingly, in the group of patients who underwent abdominal drainage, the drainage of the maximum effect was not observed (early blockage of a drainage lumen, insufficient evacuation of the liquid). According to, the above mentioned, we consider it inappropriate to leave drainage after surgery in the abdominal cavity in children with appendicular peritonitis. Seim HB (1998) Management of peritonitis. In: Bonagura JD [Ed. ], Kirk's Current Therapy: Small Practice. (12th edn), Saunders, Philadelphia, USA, pp. 764-770. Muller MG, Ludwig LL, Barton LJ (2001) Use of closed-suction drains to threat generalized peritonitis. 40 cases (1997-1999). J Am Med Assoc 219(6): 789-794. Greenfield CL, Walshaw R (1987) Open peritoneal drainage for treatment of contaminated peritoneal cavity and specific peritonitis 24 cases (1980-1986). J Am Med Assoc 191(1): 100-105. Woolfson JM, Dulish ML (2002) Open abdominal drainage in the treatment of generalized peritonitis. 42 cases (1993-1999). Surg 31(2): 174-180. Staatz AJ, Monnet E (2002) Seim Open peritoneal drainage versus primary closure for theatment of septic peritonitis. 42 cases. Surg 31(2): 174-180. Magarey CJ, Chant AD, Richford CR, Magarey JR (1971) Clinical trial of the effects of drainage and antibiotics after appendicectomy. Br J Sugr 58: 855-856. Stone HH, Hooper CA, Millikan WJ (1978) Abdominal drainage following appendectomy and cholecystectomy. Ann Surg 187: 606-612. Petrowsky H, Demartines N, Rousson V, Clavien PA (2004) Evidence- based value of prophylactic drainage in gastrointerstinal surgery. a systemic review and meta-analyses. Ann Surg 240: 1074-1084; discussion 1084-1085. Vinnicombe J (1971) Appendectomy Wound Infection, Drainage and Antibiotics. Br J Surg 51: 328.